Tom Newby’s reputation as a school of excellence in the field of drama and eisteddfod is beyond dispute. Our talented children feature in the top 5% of local and international competitions and many of our students have progressed into the professional world of media and entertainment. Most notably, Nadia Neophytou, well know radio and TV presenter was a student at Tom Newby School. The cost of training for the eisteddfod is included in school fees. Entry fees into the Benoni Eisteddfod must be paid for by participants – approximately R30.00 per category/item. 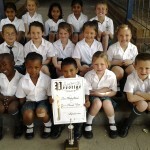 Eisteddfod is offered to Grade 1-7 learners. All practices take place on Tom Newby School grounds. The eisteddfod season runs from the middle of Term 1 to the middle of September. Practice times and competition dates and times vary – please refer to the extra mural schedule for further details. Some eisteddfod performances take place at venues other than Tom Newby School. Eisteddfod participants who need to perform off-site are required to make their own travel arrangements to and from the performance venue. Participants practise and perform in school uniform unless the particular activity requires other clothing, e.g. dramatised poetry.